Anjaan is making a huge business even before the film is completely shot. Surya and Samantha are playing the lead roles in Anjaan being directed and produced by Lingusamy. Co-produced by UTV in association with Thirupathi Brothers, Surya’s gangster actioner Anjaan is red hot in trade. Anjaan distribution rights were sold in many areas including Kerala, Karnataka and overseas for whooping price. Yahaya Bhai of United India Exports will market the film in foreign, while Sridhar Lagadapati of Larsco Entertainment has bought Anjaan Telugu dubbing 'Sikander' rights. Surya will be seen in dual roles in Anjaan after Maattrraan and Samantha is his female lead. Manoj Bajpai, Vidyut Jamwal, Rajpal Yadav and Dalip Tahil are also part of Anjaan cast. Yuvan Shankar Raja is the music director. hunting for new places and camping overnight. Children of Surya : Daughter Diya, Son Dev. * Surya got 'Dinakaran Award' for Best New Face Actor for the fim Nerukku Ner in the year 1997. * He was bestowed with Kalaimamani Award in the year 2004. * Vaaranam Aayiram film during 2008 has entitled Surya as the Best Actor by Filmfans Award. * South Scope Award was bestowed on Surya as Style Icon of the Year - 2009. 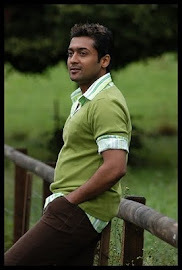 Actor Surya Blog is an unofficial fan website. This blog does not have any affiliation with Surya or any members of his family.This blog is created by a Die-Hard Surya fan. Actor Surya Blog © 2013. Powered by Blogger.